Antifungal, soothing and rejuvenating. Our Organic Palmarosa Essential Oil is produced in Nepal and has more floral and spicy overtones than oil from the conventionally grown Indian variety. Its unique fragrance is equally loved by both men and women, especially when it is used skin care products. Use it in blends to moisturize, soothe irritation, balance sebum levels, encourage elasticity of skin, stimulate cell regeneration, and tackle spots and acne prone skin. 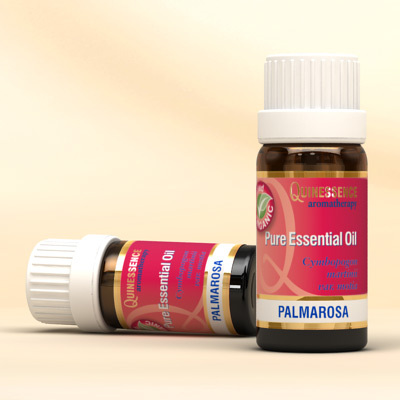 Organic Palmarosa Essential Oil is a powerful antimicrobial that easily out-performs tea tree as an antifungal, making it your first choice when fighting stubborn fungal infections. Its impressive antiviral qualities make it the ideal choice to protect against colds and flu, particularly when it is combined with other powerful antiviral essential oils. Palmarosa oil is also a powerful bactericidal. Organic Palmarosa Essential Oil is effective in massage blends to ease pain associated with overworked joints and muscles, plus it can be used to ease general aches and pains, cramps, and gastric conditions. The uplifting properties of palmarosa oil can be invaluable when addressing emotional conditions such as anxiety, nervous exhaustion and stress. Palmarosa has been shown in research to be a very effective insect repellent that is comparable to citronella.